With its intense black cherry deliciousness, it's hard to believe this is a Healthy Living dessert. But it is, thanks in part to sugar free gelatin! Stir boiling water into dry gelatin mix in medium bowl at least 2 minutes until completely dissolved. Stir in cold water. Pour into 9-inch square pan. Refrigerate 4 hours or until firm. Cut gelatin into 1/2-inch cubes. 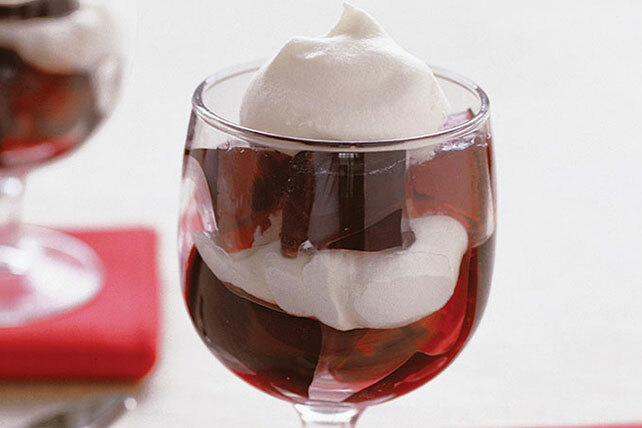 Layer gelatin cubes alternately with 1/2 cup of the whipped topping in 4 dessert glasses. Top with dollops of the remaining 1/2 cup whipped topping. Prepare as directed, using COOL WHIP FREE Whipped Topping.